Co-director of the Web Science Institute, Susan Halford, responds to Mark Carrigan‘s latest round of questions for our series on the philosophy of data science. In this feature she underlines the necessity of broad interdisciplinarity as well as further technical training to engage in depth with the web as it evolves in different ways. She argues Web Science must be a critical discipline – drawing on theory and methodology to ask questions about the nature of the web as we make and remake it. You’re one of the co-directors of the Web Science Institute (WSI) … what is ‘web science’? How does it relate to the broader landscape of computational social science, data science, digital sociology, digital anthropology and the digital humanities? Web Science began at the University of Southampton as a label to describe an interdisciplinary space for researchers to explore the evolution of the web as an inextricably sociotechnical set of practices of rapidly increasing significance in shaping the nature of the world around us. The original impetus came from the computational sciences, particularly from those who had been centrally involved in developing the technical architectures of the web in its early years and had come to appreciate that the web was evolving in all kinds of unexpected ways – at once exciting and troublesome –that computer science alone could not address. By drawing in expertise from the social sciences, humanities, medicine & health sciences, law, business and so on – the experiment was to see if and how new forms of critical engagement and analysis might emerge beyond our familiar disciplinary repertoires. This said, the term Web Science is a contested term. There are currently 15 Web Science labs worldwide affiliated to the Web Science Trust and many use the term in a narrower and more specifically computational way than we do at Southampton. Our distinctive brand of Web Science emphasises the importance of interdisciplinarity if we are to explore the evolution of web practices and to understand the artefacts and effects that emerge from these practices. This requires a broad epistemological base – we cannot rest on the positivist assumptions that have underlain the natural sciences but must also think critically about the interpretivist and post-foundational preferences of social sciences and the humanities and what these might mean, if anything, for technical politics and engineering design. Ultimately, for us, Web Science must be a critical discipline – drawing on theory and methodology to ask questions about the nature of the web as we make and remake it, to think about its consequences in term of difference and inequalities and to think about if/how we can engage in shaping its future. There is still a place for expertise – indeed, this is essential. As John Urry argued in a different context, emergent social forms need ‘insights, formulations and theories produced in diverse sites’ (Urry 2005) but we must not allow ‘lowest common denominator’ interdiciplinarity to erase the expertise and sensibilities that have – hitherto – largely been grown within particular disciplinary boundaries. However, nor – in my view – should we reify the disciplines. As sociologists, we know that disciplines have a history and are artefacts that result from a particular carve-up of academic knowledge and labour. We also know that they have a hierarchy and may involve empire building or, at least, power struggles; and that some of this is underpinned by epistemological differences, in part linked to the place of critique and political engagement. I think it is important to see the current emergence of data science and computational science on this landscape and indeed on a wider landscape still, in which ‘data’ has become emblematic of the (Western) 21st century. At times this zeitgeist suggests that all that matters is data, data, data: that once we have enough (big) data and the computational processing power, the mysteries of the universe will (finally) be unlocked. At last the realisation of the enlightenment promise! But it is of course absolutely essential that we challenge this rhetoric with carefully crafted attention to the politics of data and artefacts – as Geoffrey Bowker is rightly often cited for saying ‘‘… raw data is an oxymoron’ (2005; 184). Data are not a simple reflection of a world that ‘is’ but are thoroughly produced and this has profound implications for the kinds of questions that can be asked, and answered. At present attention to these questions diverges significantly between disciplines, especially perhaps between the computational sciences (including computational social science and data science) on the one hand, and sociology on the other. There is no reason why this should necessarily be the case, although if we think about the place of claims to distinctiveness in projects of occupational closure we may have some clues as to the attractiveness of this strategy. I am a sociologist, and I value the focus that this discipline brings to the politics of knowledge, its attention to inequalities and insistence on the importance of social structures, practices and meanings. However, I couldn’t say that sociology has a monopoly on these. They are also essential to Web Science (and of course data science and computational social science are also very welcome to them!). You’ve argued for the need to ‘get involved’ in a more hands on and technical way. What are the obstacles to this? Is methods training in the social sciences up to the job? If not does responsibility rest on individual researchers to upskill themselves? The main obstacle is obvious: most sociologists don’t know very much about the infrastructures of the web even in theory, let alone have the skills to get involved in developing web standards and protocols or building web applications. My good colleague Mark Weal (a computer scientist) put it to me, very politely, as follows: sociologists criticise the natural sciences for simplifying the social, failing to capture its diversity and complexity – pouring scorn, for instance on social media analyses that count the number of ‘happy’ or ‘sad’ words in tweets and conclude on the happiness of a nation; but at the same time we – sociologists –have strong tendencies to ‘black box’ the technical, the web for instance, as if treating it all as socially constructed means that no understanding of how it works is necessary. Of course, you’re right, as well as our disciplinary orientations there is also a question of training. We do not train social scientists in the kinds of techniques and methods that are necessary to engage in depth with the web and, to be honest, I don’t think it is viable to do this to the extent that would be necessary to take us to the level of a computer scientist trained for 8, 10 years or more. It is of course worth starting some basic training – we do this on our MSc in Web Science, where the programme that we designed led in particular by Catherine Pope and Les Carr at Southampton ensures that all students – regardless of background – take modules in semantic web technologies and hypertext (more challenging for the theologists and sociologists) as well as in social theory (which challenges the computer scientists and mathematicians). This produces informed researchers able to engage across disciplines, which is important, and develop interdisciplinary PhD projects. But ultimately we still need to draw on deep expertise that has, to date, been grounded in particular disciplines, as I argued above. And this of course depends on finding colleagues in the computational sciences willing and able to engage with more sociological projects – which can be a challenge, but is something that Web Science is beginning to achieve. The paper that I published recently with Ramine Tinati, Catherine Pope and Les Carr, which explores some of the methodological challenges of big data and showcases a new tool that addresses some of these challenges is just one good example of this, there are plenty more coming from Web Science! Whilst I accept the case that you’ve made that these technologies have implications for all empirical sociologists rather than simply those concerned with digital phenomena is it likely that the discipline as a whole will respond to them? What do you think will be the consequences for sociology if they do not? In the paper that we published in Sociology about the emergent semantic web (Halford, Pope and Weal, 2013) the point was that these innovations are likely to have implications for us all, whether we like it, or even know about it, or not. This is because they are likely to shape the architecture of the Web, the very way that it works and what we can see/do with it. Of course, sociologists will respond to the Web as it evolves in different ways and that’s fine. Our argument was that we must have some critical evaluation of this evolving web; and we should also investigate if and how these new data architectures might be harnessed for sociological research. It doesn’t need the whole discipline to respond to this – but if we don’t put some serious effort into engaging at a fundamental level the current trajectory of the web will continue without us and sociology will be left reacting to change driven from the computer sciences, rather than shaping the agenda and evolution of the web. 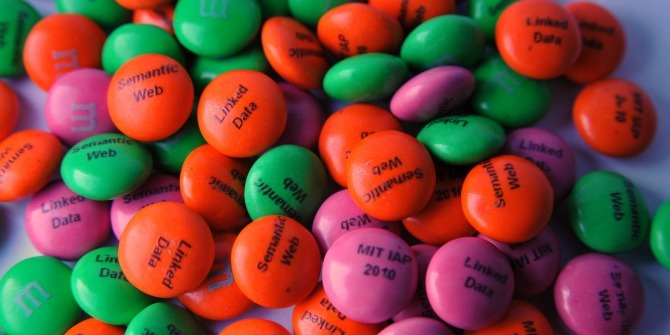 For me, the priority now is to develop sociological engagement with semantic linked data – to understand in depth how what Tim Berners-Lee has called ‘a complete sea change’ in the web might shape our global knowledge systems, and how we as sociologists can harness this for our research. This interview is part of an ongoing series on the Philosophy of Data Science. Previous interviews in the series: Rob Kitchin, Evelyn Ruppert, Deborah Lupton. Susan Halford is Professor of Sociology and Head of the Division of Sociology and Social Policy at the University of Southampton. She is Co-Director of the Work Futures Research Centre and Co-Director of the Web Science Institute. Susan is on twitter @susanjhalford. Mark Carrigan is a sociologist based in the Centre for Social Ontology at the University of Warwick. He edits the Sociological Imagination and is an assistant editor for Big Data & Society. His research interests include asexuality studies, sociological theory and digital sociology. He’s a regular blogger and podcaster.